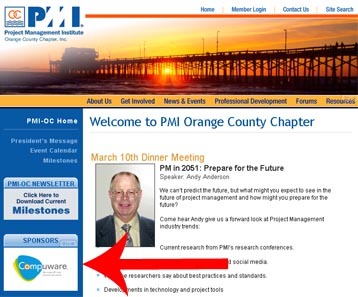 Milestones is PMI-OC's monthly newsletter distributed to over 1,600 PMI-OC members and over 5,000 project management professionals in our community. 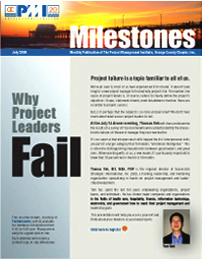 Milestones is a valuable resource for notifying members of Chapter activities and providing information regarding project management tools and techniques. We invite you to market your company by advertising and submitting articles in Milestones. Discounts are available for repeat advertisers. No fee is charged for articles submitted on general project management topics. Click here to view Milestone Samples. Send an email to advertising to request an Advertising/Sponsorship Package that will include pricing and Ad Specs. With the implementation of our new website we've added a FLASH SPONSORS feature to every page, on the left navigation area. For a monthly fee we can add your company's logo, and a link to your website to the Sponsor area. You can purchase website advertising/link separately, on a quarterly, semi-annual or annual basis. Or, some of the sponsorship packages include a web logo and link for a limited time period. 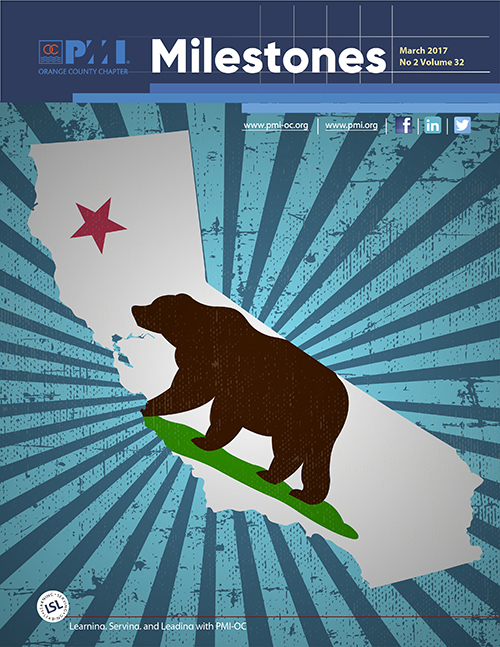 The Chapter sends out an eNewsletter each week to over 4,500 PMI-OC members and local community email addresses. Our statistics show that we have at least 1,000 opens for each newsletter. We are offering an Advertisement that includes company logo and link, and a one-line tag line. Contact our Advertising Coordinator at advertising for additional information or to obtain an Advertising/Sponsorship Agreement package.